ADVANCE REGISTRATION FOR AAOP 2017 IS NOW CLOSED. ON-SITE REGISTRATION WILL OPEN AT THE TALKING STICK ON MAY 4, 2017. The AAOP Scientific Meeting prohibits the marketing or promotion of commercial products and/or services in conjunction with CE activities. Commercial Products and literature are to be confined to the exhibit hall and are not permitted in the lecture hall. Due to the professional nature of this meeting children are not permitted in either the lecture hall, exhibit hall or poster viewing areas. Business casual attire is appropriate for this meeting. No matter what our field or specialty of dentistry, the clinician must always be prepared to encounter the patient with pain. Pain management in dentistry depends on an accurate diagnosis. This review course will discuss basic concepts of orofacial pain. Material, including case presentations, will be suitable for clinicians of all levels. Come prepared for a lively discussion and share your knowledge. Participants will gain an understanding of an organized method for reviewing and assessing difficult cases as well as a review of basic orofacial pain concepts. An introduction and update on the diagnosis and treatment of headache as it relates to Orofacial Pain. •	How do sleep disorders and orofacial pain relate – is it bi-directional or is it a multi-directional approach? Synopsis: The morning session will give the orofacial pain specialist new and exciting information about recent research of cervical muscle pathology and its correlation to orofacial pain. In addition, research presentation on cervical and oral dystonia will add to the clinicians understanding and the ability to recognize these movement disorders and comprise an adequate treatment plan. The afternoon session will focus on comprehensive and evidence based cervical spine muscle rehabilitation for patients with orofacial pain. time TMD and facial pain practitioners spend with patients, thereby increasing office productivity. 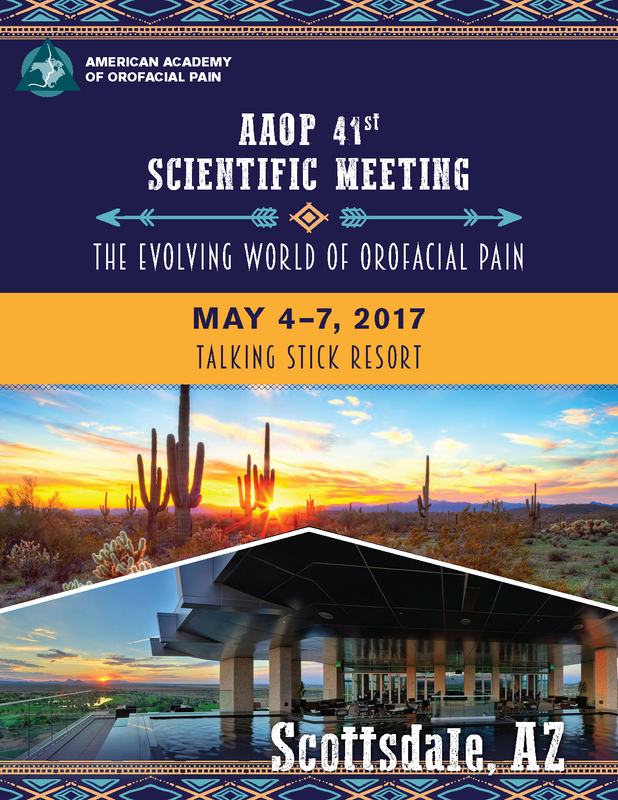 ADVANCE REGISTRATION FOR AAOP 2017 IS NOW CLOSED AND WILL REOPEN AT THE TALKING STICK ON MAY 4, 2017. The American Academy of Orofacial Pain is designated as an Approved PACE Program Provider by the Academy of General Dentistry. The formal continuing dental education programs of this program provider are accepted by AGD for Fellowship/Mastership and membership maintenance credit. Approval does not imply acceptance by a state or provincial board of dentistry, or AGD endorsement. The current term of approval extends from 1/1/2015 – 12/31/2018. Provider Number: 218197. Total credit educational hours being offered at this conference are 26.75 (including core conference, preconference workshops, breakfast forums & lunch sessions). The core conference offers 15.75 CE hours. Each preconference offers an additional 6 CE hours, each breakfast forum provides 1 CE hour and each Lunch and Learn provides 1.5 CE hours. Each attendee should claim only those hours of credit that he/she actually spent in the education. Workshops, breakfast & lunch sessions all require additional registration.